Good morning, Friday! Naked coffee, mystery Lady in Red and Levon Aronian taking 1st place in Gibraltar ahead of a very strong field. Details below and more to come. Enjoy! Starbucks to label coffee with cancer warning! Unbelievable! Starbucks, 7-Eleven and some other well known establishments in California have settled a 2010 lawsuit launched by CERT (Council for Education and Research on Toxins) to force coffee sellers to have labels warning clients of the dangers to their health. 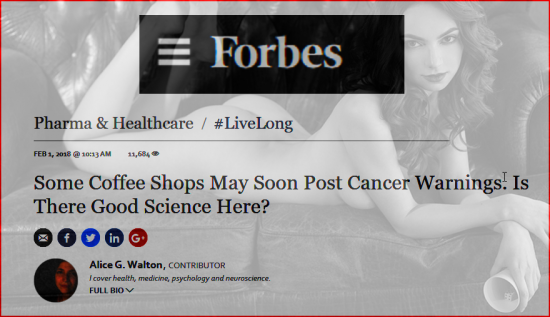 Yesterday Forbes published a very rational and balanced article on this issue and I recommend those coffee drinkers amongst you to take a quick look and see. While the science of it can be debated, lobby groups in the US have just too much money to spend on lawsuits pursuing nonsense claims. It appears that Starbucks has decided it just was not worth fighting it anymore. Mystery Lady in Red! Who is she? Just found the FaceBook of the Moscow Chess Federation and on the front page this stunning Lady in Red without any identification attached. Pity. Can my readers help out? Don’t get me wrong, this study was done in a very professional manner by very professional and respected individuals. The problem is that the underlying assumption that one can take the ELO rating system as a solid basis for comparison among all groups of chess players is on shaky ground, at best. It is true that the ELO system can be expected to give relatively accurate expectations of how a player will perform, but only amongst players with established ratings. What one finds in practice is that certain groups, especially children, are constantly improving and so any ELO-comparisons are pretty meaningless one week to the next. The same thing holds true for women players, who are often found playing more against other women than against males. This creates rating inflation/deflation. (The same thing occurs when comparing ELO averages between countries that do not have large memberships with countries that have large and active memberships) No wonder it was found that the expectations when female plays female are different than from female plays male. The ELO rating system has some very real flaws which have never been addressed by FIDE, but which Professor Elo (the creator of the ELO rating system) himself pointed out. His recommendation was not to take his rating system too serious, which is, I fear, the flaw of the above quoted study. 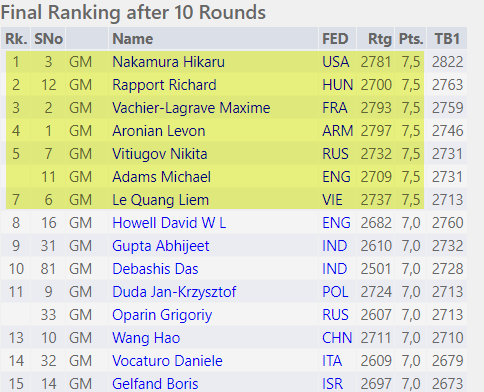 It was a gruelling 10 days, but when the tournament officially ended there were not less than 7 players tied for first with 7.5 points each. The tournament rules required that there be a CLEAR winner, so a series of tiebreak matches (quick time controls) were held and Aronian emerged – as he usually does in such matches – victorious. Congrats! Next story Sunday’s winning 5-second tactics!